Trey Flowers was signed by the Detroit Lions to come in and dominate from the jump, and the good news is, that's exactly what he could be expected to do given his high profile in the league. Flowers is getting a ton of respect from the media in the lead up to 2019, and many are calling him an instant impact type free agent for Detroit. In a Bleacher Report piece by Maurice Moton, the free agents expected to make the biggest impact were explored, and when it came to the Lions, Flowers was an easy choice to make given what he can do on the field for Matt Patricia's defense. 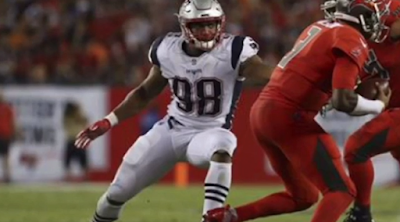 "Unlike Ford in San Francisco and Smith in Green Bay, defensive end Trey Flowers will be reuniting with a former play-caller in his new destination. Detroit Lions head coach Matt Patricia served as Flowers' defensive coordinator with the New England Patriots and guided him through two strong seasons between 2016-17. Under Patricia, Flowers logged 13.5 sacks. He also moved inside to set the edge against the run, and he'll likely take on similar responsibilities in Detroit. Most importantly, the 25-year-old steps into the lineup to replace Ezekiel Ansah, whose 2018 season ended prematurely after re-injuring the same shoulder that required surgery after his rookie year. Ansah remains available on the free-agent market. Last season, the Lions run defense ranked 10th in the league; Flowers' toughness and ability to wrap up ball-carriers on the ends should further push this unit to the top in yards allowed on the ground. Flowers' familiarity with Patricia's system should help him become an immediate high-end contributor in Detroit. Because of his age, the fourth-year pro may not have hit his ceiling yet." Indeed that is the hope for the Lions, and it's encouraging that so many think Flowers can make such a large impact for the team quickly. With that confidence, expect Flowers to fit in well for the Lions and perhaps make a fast impact.